Microsoft's pushed a new video ad to its Windows Phone YouTube channel pitting the Cortana AI against Apple's Siri - and it didn't go to well for the fruity assistant. "Next time you talk to Caroline, I'll remind you," Cortana dutifully responds. This is where things take a dark turn for Cupertino's flagship AI. "Oh no, I cannot do that," concedes Siri. 1-0 to Cortana, then. "Oh and remind me to get roses when I'm near any flower shop," requests the absent-minded gadgeteer. "Sure thing - remind you when you get to flower shop," promises Cortana. "I can't do that either," groans Siri. It's not looking good. "Cortana, it's gonna be a great night. Oh wow, thanks for the traffic alert. I better get going," says the voice, smitten with his Microsoft AI. "Now that is a smart phone," says Siri, admitting defeat. 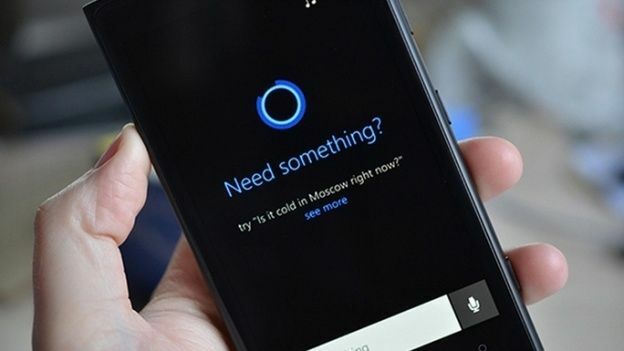 Cortana, Microsoft's voice-assistant, is set to land in the UK any day now, and looks to compete with other AIs like Siri and the BlackBerry Assistant. The software, whose fitting namesake is Master Chief's AI companion in the Halo video game series, was first demonstrated in April earlier this year at Microsoft's BUILD conference. "Cortana. You're going to be on Android and iPhone"
"I'm sorry, I didn't get that"